Our "retro" fishes have been a very important part of our board collection over the past few years. Designed by Californian master board builder Clyde Beatty jnr, who has been credited with being a main player in the evolution of the rocket fish since the 70s. Clyde designs these with our local input to create these small wave masterpieces. Our aim was to create a range of boards that paddle and catch waves easy, super stable with remarkable manouverability. We have achieved this by packing as much foam as realisticaly possible into a relatively short edge length. So the boards are wide ( the keel fishes are all between 22"- 22 3/4" wide and the quad fishes are all between 22 1/2" and 23 1/4" ). Our "flat deck" design allows the projection of foam out to the rails , giving increased stability and volume, which allows faster paddling, early wave entry and faster turns on smaller waves. Bigger guys have easily dropped down from longboards onto these fishes. Maybe you can too, try something different !! As with all our board range, please call to check availability before you make a purchase, as options can quickly go out of stock. Our 2013 fish colection is now available. This polyester / polyurethane core custom fish shapes are a dream for the smaller slower waves found here in the U.K. This version has 3 stringers and laminated with volan cloth to give it that "retro" look and feel...................Truly stunning !!!! Features include flatter rocker for speed and wave catching, great width for stability and planing, v tail gives superb rail to rail transition, chined rails for release, Flatter deck for maximum volume and stability. These boards are also super manouverable due to their short edge length. 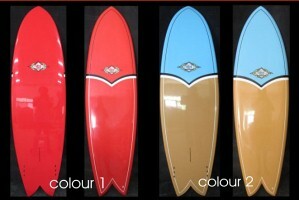 Available in twin keel, or quad fin set ups (FCS fins and plugs). This lightweight painted epoxy / styrofoam core custom fish shapes are a dream for the smaller slower waves found here in the U.K. This version has a single stringer and laminated with epoxy resin and 6oz cloth . Features include flatter rocker for speed and wave catching, great width for stability and planing, v tail gives superb rail to rail transition, chined rails for release, Flatter deck for maximum volume and stability. These boards are also super manouverable due to their short edge length. Also vailable in twin keel, or quad fin set ups (FCS fins and plugs). This lightweight clear epoxy / styrofoam core custom fish shapes are a dream for the smaller slower waves found here in the U.K. This version is laminated with clear epoxy resin and 6oz cloth . This polyester resin / PU core custom fish shapes are a dream for the smaller slower waves found here in the U.K. This version has a single stringer and laminated with polyester resin and 6oz cloth .